The Minnesota State Historical Society created a directory of early Minnesota professional photographers. It’s an indispensable tool for photo-historians and researchers. This picture was taken by Joel E. Whitney. He was notable for taking the very first picture of Minnehaha Falls while working with Alexander Hesler in 1852. They took a few dozen daguerrotypes of the Falls on that day, and perhaps a few survive today. This is not one of them. An early picture of the Falls. There is no sign of development except the foot path. This same picture was also published by Whitney with an earlier back mark, one with the address of “Third and Cedar, St. Paul.” The directory dates this address to 1851-1867. Given all this, it is certain that this photograph predates 1867, it also predates the well-documented Carbutt visit of October 1866, and probably predates the Civil War. 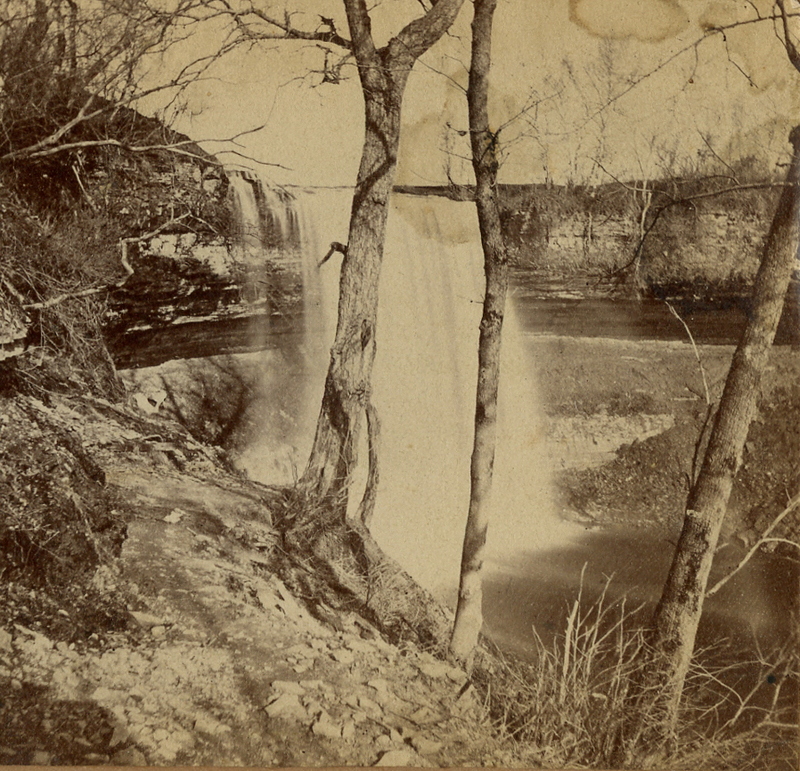 Most likely, this is Minnehaha Falls in the late 1850s, just after Franklin Steele took ownership of it for the first time in 1857. Joel Whitney called this viewpoint “the Middle Terrace.” Unfortunately, the name seems not to have stuck. Next Next post: Even after WWI….